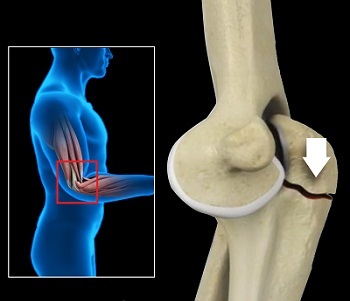 Elbow bursitis can be diagnosed by reviewing your medical history and undergoing a thorough physical exam. Dr. Patel may also order an X-ray and biopsy of the bursa fluid to test for infection. Elbow bursitis not caused from infections can be treated with an elbow wrap to provide compression to the area, avoiding activities that place direct pressure on the swollen elbow, taking anti-inflammatory medications to reduce swelling. A majority will respond to conservative treatment with strict compliance. If bursitis is caused due to an infection Dr. Patel may recommend removal of fluid from the bursa with a needle and prescribe antibiotics. There typically is never a need to drain or inject the bursa but this can be done if conservative measures fail. When these methods do not help, the bursa is surgically removed.